The Total Rock Drummer by Mike Michalkow is a unique and exciting journey through the diverse world of rock drumming. Start with basic drumming lessons in keeping a beat and work your way up to playing sophisticated drum solos and fills. The Total Rock Drummer features many of the styles that make rock drumming so challenging yet rewarding. The drum tutorials are meant for all drummers from beginners to advanced players. Learn everything from rockabilly and reggae to funk and progressive rock. 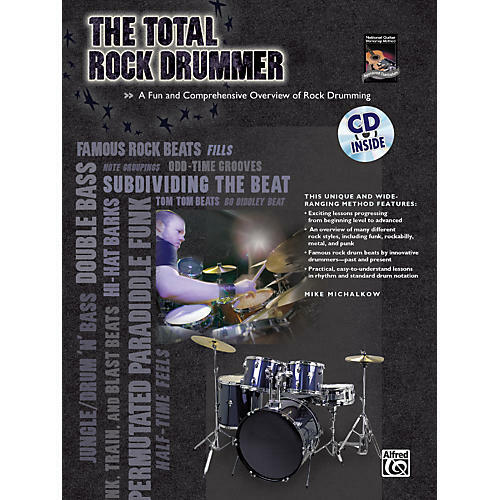 The instructional book and CD include actual drumbeats from famous rock tunes by Led Zeppelin, Van Halen, the Red Hot Chili Peppers, Metallica, The Police, Tool, Green Day, and more.